It is time to tackle the humanitarian and public health crisis of homelessness. This measure creates the “Our City Our Home Fund” which will allow San Francisco to make real progress evidenced by a marked reduction of suffering on our streets, resulting in increased safety and quality of life for all San Franciscans. Rather than taking a piecemeal approach to addressing homelessness, “Our City Our Home” makes a large investment in the services we need to comprehensively address homelessness among all populations: youth, families with children, single adults, and people experiencing substance use disorders and mental illness. 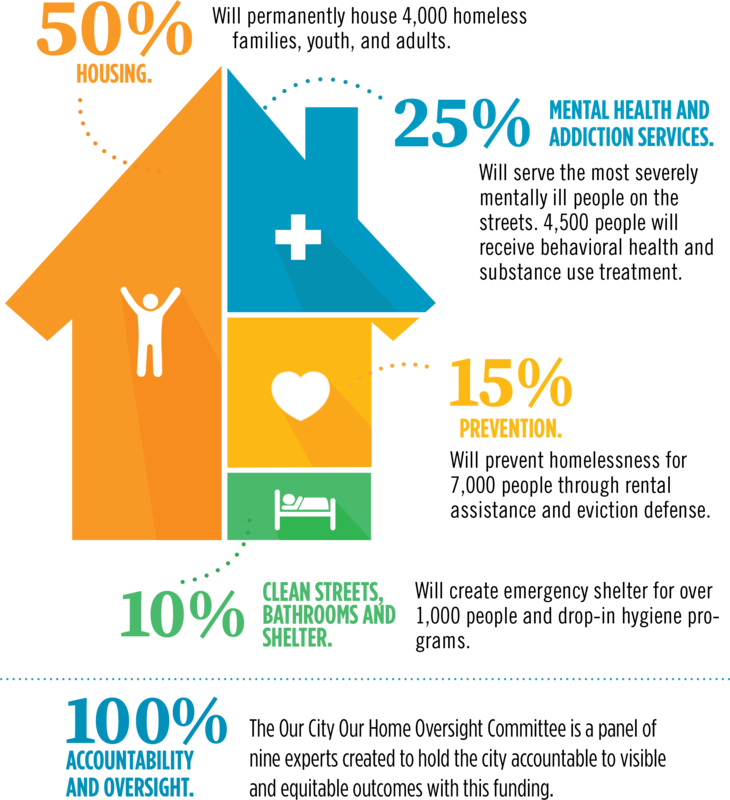 At least 50% of the fund ($150 million) must go to housingHousing solves homelessness. This would pay for construction, rehab, prevention and operating subsidies of approximately 4,000 units of housing and mandates that families and youth are served. Our goal is to house all those who are currently experiencing long term or chronic homelessness, are sick, or who are families with children or youth. This is funding for intensive wrap around services, street-based care, treatment, drop in services, residential facilities, and housing that targets our people suffering the most from mental illnesses and addiction. Given the high cost of living, many people in San Francisco are housing insecure. These people, who live in fear of losing their rent-controlled unit, who are one medical emergency, fire, or other personal disaster away from homelessness, deserve our support and protection. This would ensure 7,000 households get legal assistance, permanent or temporary subsidies to stay in their housing, or other forms of help they need to stay housed, such as help with electrical or other bills. This measure will pay for 1,075 new shelter beds/navigation center beds as well as fund drop-in hygiene programs. Let's keep our streets clean by having dignified bathrooms and showers for everyone. This initiative requires an Oversight Committee comprised of nine experts on homelessness, supportive housing, mental illness, substance abuse, and development, who will recommend funding priorities, promote transparency and cultural competence, and produce a regular report about who has been served by this fund and what still needs to be done. This initiative will make San Francisco a more humane and beautiful place to live and work. Homelessness hurts us all. Let's reduce the number of homeless people on the street, address the mental health crises experienced by survivors of this trauma, create more public bathrooms and showers, and protect the housing insecure.